Play Is It True with today's guest Marianne Rice, author of Strawberry Kisses, a contemporary romance. This is a game in which authors answer yes and no questions. They can elaborate on answers as much as they choose. After being rescued from an abusive relationship, Rachael is nothing more than a shadow of her true self. The only place she manages to find some degree of comfort is in the kitchen, hiding behind her apron as she continues to shut everyone out. Her foster sister knows that the real Rachael has been broken and reaches out by signing her up for self-defense classes with the hope of getting her outgoing, confident and nosey older sister back. Teaching self-defense is Jake’s way of giving back, compensating for what has been taken away from him years ago. He’s well aware that most women in his class have a backstory, and avoids getting emotionally involved by keeping his distance—until a beautiful, blue-eyed woman walks in. Jake is instantly drawn to Rachael and sees the inner confidence she tries to hide behind her blonde bangs and hunched shoulders. As Jake helps Rachael find the strength she once had, a secret of his past is revealed and threatens to ruin the safety they have found in each other. There’s more connecting them than just their mutual attraction. Once their pasts finally collide, revealing a devastating truth, Jake’s feelings and commitment toward Rachael is put to the ultimate test. Nope! 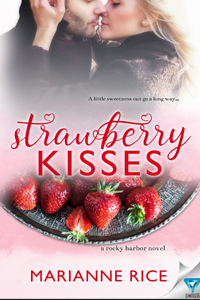 Strawberry Kisses is my ninth book! Yes, it’s book two in my Rocky Harbor series, but all books in the series are standalone. Nope. I love sleep too much to ever go without. Yes, a little. I researched pictures of hot guys (so I’d have a visual for hunky Jake Morgan), lots of strawberry recipes, and the ins and outs of self-defense training. No puppies in this one, but there is a dog in the first book, Staying Grounded, and the next book Wounded Love that comes out May 2nd. No. It’s contemporary romance. However, there are elements of women’s fiction. So maybe...romantic women’s fiction? Only if you count crazy lady. Far from it! I grew up in southern California and now live in Maine. YES!!! Even being five minutes early makes me nervous. I’m always, always, always early. I’ve never had it. The idea of raw fish is not appealing to me. If you count three kids. Hubby is allergic to all animals, even to hypo-allergenic breeds. The interview is lots of fun! And the book sounds amazing! What a fun interview! Need to go buy the book! Great interview! I haven't tried sushi either - just can't get past that raw fish thing, hehe. Great interview and fun answers. I have the book and it's queued up for reading when I take off for Morocco tomorrow morning.